Today marks one month into the new school year. We had some changes this year, because M is going to preschool half-days (has to learn Czech somewhere) and K finished preschool/kindergarten and started homeschooling first grade. We did our Official First Day of Homeschool on the first day of regular school. We went to the Sea Life Aquarium and had a play date. Think of it as a sort of school independence day. Then we started regular lessons on the second day of school. We had a bunch of unforeseen circumstances, like M staying home from preschool for a week because he was sick, followed by a week of school, a nasty virus for me (while the Slovak was on a business trip!) and then several days of (planned) travel to a translation conference in Athens while the little ones stayed with the grandparents. And of course I came back home with bronchitis/pneumonia and had to stay on bed rest for several days. With all of that, it's actually kind of surprising we have done any school at all! We're busy with math, spelling and handwriting (English print and Czech cursive) and spent quite a bit of time on prehistory over the past several weeks. We're doing ancient history this year just because history is fun. The extracurricular schedule of afternoon activities is just about complete, with things scheduled three afternoons per week. K is still a reluctant reader, but she is capable of reading when she tries. She is much more willing to write, so she is learning to read through spelling. She enjoys math so much that she has mentioned the possibility of being a "math superhero" who saves people by doing math problems for them. In fact, K enjoys math and science so much that I almost wonder if we have a STEM child on our hands. She complains to high heaven about history (I read a child's history book and then we do activities or look at books on the same topic), and yet a day or two later comes to me asking questions and wanting to learn more about...archeology, cave people (she objects to the term cave men), early farmers... She actually really enjoys history once I've introduced a topic. K's new stated ambition is to be an archeologist. Maybe a paleontologist. She has asked me if kids can do archeology or if she has to wait until she grows up. There's a place an hour or two from here that shows a medieval Bohemian village with traditional crafts you can try and also apparently has an archeology section for kids. We are SO going there as soon as it re-opens (closed for the winter already, unfortunately). As far as reading, K has acknowledged that it might be a useful life skill to acquire someday. She just doesn't want to rush into anything, so she told me she thinks she will be ready to learn in second grade. Maybe third. Also, during spelling today, she flawlessly spelled ten words I gave her, then for the last, bonus phrase...drew a detailed picture to illustrate the phrase, instead of writing the words. That girl still cracks me up. Okay, okay, it's more like 2.75. But he's not three yet! M's speech has made lots of progress over the past year. As in, he does it now. As I wrote last year, he has been a late talker and enthusiastic signer. He is in that awkward two-year-old stage where the family understands most of what he says and other people mostly don't. In his case it is partly complicated by the fact that he pulls from all three languages and that he leaves out or changes at least half of his consonants. For instance, we were watching a Slovak video and I pointed out a rabbit (in English), which he corrected: "No, ha-ha-hik." Králíček? (CZ) "NE, ha-ha-hik." Zajačik! (SK) But who could get that from hahahik on the first try?? That said, however, he is clearly a more balanced bilingual at this stage than his sister was (since we lived in UK at the time). His CZ/SK and English have developed more evenly, though English is still stronger. He has started preschool already (the same one where K went), which has certainly had an impact. If you can get past the pronunciation barrier, he actually has quite a bit to say! I've noticed some relatively complex sentences and ideas coming from his direction, cogent arguments aimed at his sister, that sort of thing. Like when she was interfering with his Angry Birds game: "You no touch my Angry Birds. Me touch you Angry Birds? No. So you no touch mine either." An irrefutable argument. And of course, while we're on Angry Birds, there's the oft-repeated question: "Why you so angry, Angry Birds? Don't be angry - be happy! See? (big smile)"
We've also been seeing the difference between an only child and a younger child in terms of learning - M has plenty of inspiration and opportunity to learn in a way K didn't have, because he is exposed to what she is learning, too. The main thing being the day he pointed to a letter and said A...and it was an A! He also knew M. K, of course, has been learning to read, so he was apparently paying attention. After that he wanted to name all the letters in the title of every book we read, which is how he came to know his alphabet at two years old. He recognizes all four of our names when written down (plus Babka and Dedo I guess), but doesn't do anything like reading. He just knows the letter sounds. More sounds than he can pronounce, actually. I theorize that he may actually learn to read before he is potty trained, because unfortunately there has not been much progress on that front this year. Loves: dinosaurs, fish, animals in general, books. His big sister. Maybe passion would be a better word. M is very, very, very enthusiastic about the things in the above list. We've taken him to the zoo, to a dinosaur bones exhibit, to the aquarium, even to the Pergamon (ancient history) museum, and he loved them all. He engages with things in his own way, on his own level, but clearly gets something out of the places we go. K has been experimenting with translation recently. I taught her the old rhyme: "I scream, you scream, we all scream for ice cream!" We were on the way to get ice cream at the time. Once she had memorized it, she said, "I know what it is in Czech. Já křičím, ty křičíš, my všichni křičíme na zmrzlinu. (pause) It doesn't rhyme that way. But I said it right..."
I told her even though she said the words right, they won't rhyme in another language necessarily. She's still wrapping her head around that. That wasn't the first rhyme she's tried to translate - I've heard her sometimes trying out Czech nursery rhymes or schoolyard chants in English, repeating them over and over trying to get them to flow or rhyme the way they do in Czech. Some efforts are more successful than others. She's a braver girl than I - I won't touch poetry or song translation with a ten-foot pole! "Do you mind if I ask - is your husband a foreigner?" "Well, I guess so, he's Slovak." "I see...because I've noticed you speak English with your children in the store." "Ohh, well, that's because I'm American." She expressed some surprise at that and then started talking about bilingual parenting and how her kids don't want to speak the family language at home and the difficulties of raising children in a foreign country... She and her husband are both from Uzbekistan, but their children only want to speak Czech. And what can you do when you have to work and they are in after-school care until 5 pm? Probably the nicest conversation - with the nicest employee - I've ever had in that store. It may have been a year and a day since I last posted, but I have to say the Slovak has never stopped pestering me given up hope that I would blog again. Baby M is now a few months older than K was when I started this blog. M will be three in October and is currently in the throes of his terrible twos. Or is it the rest of us in the throes of his terrible twos? Either way, he has opinions and they are loud and emphatic. He started attending preschool and his Czech has really taken off. He mixes Czech and English like a pro but is pretty good at speaking the right language with the right people. We understand most of what he says, but it takes some context clues and/or guesswork sometimes, like "ha-ha-hik" (based on context - rabbit? No! Králíček? No! Zajačik? Yes!). M has a passion for animals (especially dinosaurs) and modes of transport (especially cars). He recognizes more or less the entire alphabet (apparently younger children teach themselves this kind of thing) and loves counting. He can count in English (up to 7 or 12, depending on if he stays on track) and in Spanish (up to 6 because of a song he learned). This makes for comic looks of surprise when strangers hear a young (to all appearances Czech) child counting in not one, but two foreign languages! K has now finished kindergarten and is gearing up for first grade this fall. She switches effortlessly between English and Czech and is getting better at holding conversations in just Slovak as well. She can read in English and Czech, though she still asks me sometimes if people really need to learn to read if they plan on getting a job that doesn't involve reading. K loves drawing, writing (totally not the same as reading) and has been lobbying hard for her own laptop for some time now. She was apparently so eloquent on the subject one morning on the way to kindergarten with Apo that the other passengers on the bus started laughing. She NEEDS a laptop once she starts first grade, she said. Because education. However, she has gone on record that she would settle for her own iPad if we really won't get her a computer. We are still reading a chapter or so each night. Recently we read Charlie and the Chocolate Factory and yesterday we finished the first book in the Chronicles of Narnia. K is a very satisfying audience, because the stories are all new to her and she is shocked, tense, sad or excited at all the right places. She has also been reading Pippi Longstocking in Slovak with Apo on nights when I don't read. Loves that one, too. So, anything new with you? After the park-aversion of the last two years and the parkless wasteland that was this spring I am now making it all up to my children by going to the park almost every day. This is the first year M has been old enough to play (as opposed to crying while refusing to nap a la last summer), which is great except when he chooses to do a runner which is, like, always. This is why I refuse to go to any playground that doesn't have a fence. Fortunately, there is one park near us with a nice solid fence, gate that stays shut, plenty of shaded seating and things to play with for both my children's ages, so that is our park of preference. K would like some variety, but the huge gorgeous playground and family area near our house is too big and spread-out to keep an eye on two children, especially if one of them is a 21-month-old escape artist. Maybe next year. For now, almost every afternoon we spend two or three hours at the playground. M rides his motorka or plays in the sandbox, K practices various flips and climbing maneuvers she has seen the big kids do, and I sit on the bench and (not being forced to trail after the toddler to keep him in the area) quietly read a book. It's the best thing ever. I've actually been managing to keep up this park schedule while having one of my busiest work months of the year, so that time sitting on the bench reading is often my only down time all day. I often find myself answering work emails from the park, so it's not unusual to come home with more projects than when I left. Unfortunately it isn't practical to do actual work from the park, but then it does give me the perfect excuse to take the time to just read. I also love watching the little ones play, though, in their own different ways. K is a daredevil and has completely mastered almost all playground equipment. She can climb the rock climbing wall, do a back-flip off the soft climbing equipment, slide down the pole and actually very nearly climb back up it again. She has also made friends with a couple of other park regulars, so she usually has someone to play with. M likes playing with the playground stuff (sandbox, slide), but is happy to zoom around on his motorcycle the whole time, too (all Czech kids have a motorcycle/motorka). Some days he only gets off it to borrow someone else's motorka (while someone borrows his). Most of the time he plays on his own, though he is interested in watching and standing close to the other little children there, and sometimes he follows K and her friends around. She is a good big sister so they are nice to him. I am pretty pleased that he hasn't hit anyone or flipped out when someone touches his motorka, takes a toy away, or similar. He handles it very well so far. We don't have any playgroups to go to so this is his main opportunity for social interaction. It was in that park a few months ago that I taught K to ride her bike without training wheels. She got the hang of it ridiculously fast (I had, um, significantly more trouble as a child) and now after some sessions with Apo she is a confident rider and considerate of other people (riding carefully, avoiding getting too close, letting people pass). Basically, what I'm saying is...wonder where I've been? In the park! Conversations: Do YOU like making small people happy? Earlier this week at park: "Mommy, that's my new friend Nemonika (not-Monika)." "I just heard her mom call her Domi, so I'm pretty sure it's Dominika." Today at park: "I have to go, Mommy, I see my friend Demonika." "Demon" means the same in Czech as it does in English, FYI. "He really wanted to, and I wanted to make him happy. I like making small people happy. Do YOU like making small people happy, Mommy?" Something about her tone in that last sentence made me feel kind of guilty...though as it turned out it wasn't a trick question. The Slovak has had some late meetings this week, making him get home late three days in a row. Yesterday she told me, "Mommy, I'm sorry. You're probably going to miss me, but you'll have to come get me late from school tomorrow, after druhá sváča (afternoon snack, about 3 pm). I have a lot of work and meetings to go to. Kid meetings." K knows all the words to (the chorus of) "Do You Hear the People Sing?" in English and is learning it in Czech and French (we have a lot of soundtracks). She also knows almost the whole "Confrontation" song because the Slovak likes to burst out singing it at random. I know Rach will appreciate this. K can also belt out all the words to "Mně se líbí". I have never been prouder as a parent. It has also come to my attention that K is introducing her friends to French historical fiction. Recently she told me she and two friends were playing "Valjean and Javert" and K's friend had to be the policeman and chase her. I asked in surprise if her friends knew the story, and she answered, "No, but I told it to them." Wait, NOW I've never been prouder as a parent. Mama - native English (American), fluent Czech. Moved to Prague in 2003. 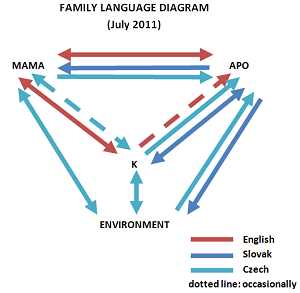 Apo (Daddy) - native Slovak, fluent English. Moved to Prague in 2000. K - Czech-born Slovak-American, born in Prague in 2007. Wants to meet someone from every country there is. Baby M - Czech-born Slovak-American, born just outside Prague in 2011. Chillest baby ever. What on earth is a "havo"? I am an American married to a Slovak based in the Czech Republic. We are raising our children with a mostly OPOL approach and greatly enjoying all the language mixing they come up with.